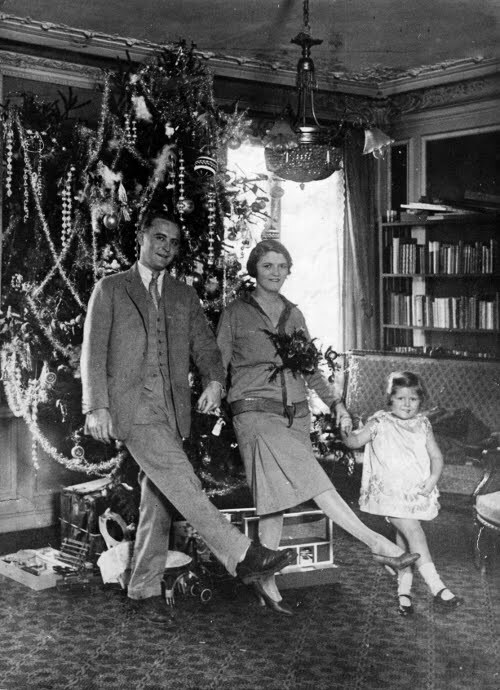 The Roaring Twenties was a festive time and Christmas was no exception. Drop-waisted flapper dresses, jazz music, dancing, and lavishly decorated trees were all part of the 1920s Christmas experience. Much more round in shape than they are today, Christmas trees in the twenties resembled something that could've been extracted from the house of Herman and Lily Munster. The footloose and fancy-free flappers were not focused on decorations in early November. They were busy out dancing the night away and waited until Christmas Eve to set out their trees, which they garnished with cotton spun ornaments and strands of popcorn or beads. In 1923, Calvin Coolidge was the first president to preside over the National Christmas tree lighting ceremony. Before him, the first actual tree in the White House was displayed in 1889 following the first Christmas party held in December of 1800 for the Adams's 4-year-old granddaughter. "I remember the trees we had in Europe: one Christmas we spent drinking under the gold statue of Victor Emmanuel in Rome, lost in time and space & the majestic prettiness of that square before the cavernously echoing Piazza Cologna. The tree was covered with silver bells which rang hauntedly through the night by themselves…..and we had a tree in Paris covered with mushrooms & with snowy houses which was fun. There were myriad birds of paradise on the tree with spun glass tails. And Nanny kept busily admonishing us about the French customs: how they did not give gifts at Christmas but at New Years…..then we had a tree on the Avenue McMahon which Nanny & I decorated between sips of champagne until neither we nor the tree could hold any more of fantaisie or decor. We kept our decorations for years in painted toy boxes and when the last of the tails wilted & the last house grew lopsided, it was almost a bereavement." Christmastime attire for a care-free girl in the twenties would have consisted of a classic flapper dress spruced up with lace, bows, and, of course, fringe. They would have completed the look by slipping on their finest fur-collared coat to keep them warm on a wintry, December night. As I'm obsessed with all things from the 1920s, I chose lace and more lace for my two latest designs. It was widely used for dress overlays throughout the Jazz Age and has a soft femininity to it while being easy to work with while constructing a garment. The first dress I sewed is made of black lace and mesh that I spotted at a local fabric shop. It has an exposed metal zipper running down the back. For the second look, I used a pretty blue lace for the top and an Italian woven for the skirt. It is fairly stiff, which worked well since I wanted to create some volume that would be perfect for a holiday party.